How do you use a waffle iron to create a shoe? What goes into designing an innovative football jersey? Join faculty from the School of Art + Design’s Sports Product Design program at OMSI’s Makers Faire, September 15–16 in Portland, as they demonstrate the science, engineering, and design thinking behind effective product design. The event, sponsored in part by the University of Oregon’s Student Services and Enrollment Management, is intended to inspire participants to delve into studies and careers related to STEM and other fields. Happening on Saturday, September 15, at 4 p.m. and Sunday, September 16, at 2 p.m. on the Innovation Stage, sponsored by the University of Oregon, is “Sneaker Science: How Designers Protect Athletes” with Program Director and Associate Professor Susan Sokolowski and Assistant Professor Alex Xu from the Sports Product Design Program at the UO in Portland. Sokolowski and Xu will lead experiments about sport footwear traction and impact protection with help from audience participants. Volunteers—with support from Puddles, the UO Duck mascot—can become sneaker scientists, donning lab coats and safety goggles to help conduct crash tests with eggs. They can experiment with how well certain materials protect the eggs, all while learning about design thinking, color theory, manufacturing techniques, and materials science. “Sports Product Design is a great way for everyone, young and old, to learn about STEM-related disciplines,” Sokolowski said. 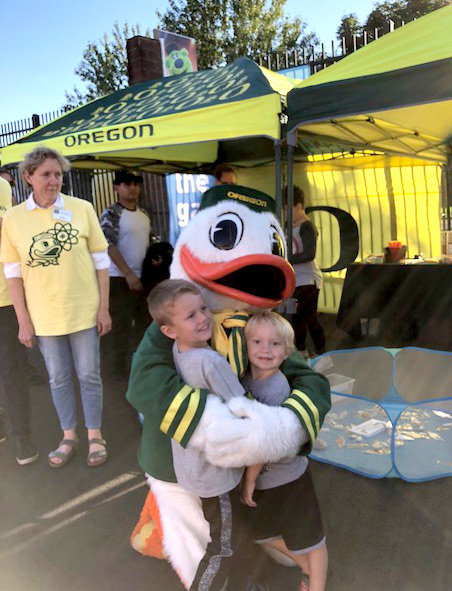 At the UO’s booth at the Faire, visitors can create their own innovative football jersey and sneaker designs by working with templates to learn about the processes. Visitors can hear the story of former UO track coach Bill Bowerman and his creation of NIKE shoes made with waffle irons. Participants can also make rubber waffle outsoles using simple kitchen ingredients to mix their own rubber compounds and mold rubber waffle parts. “We are excited to present at this year’s Makers Faire where we can celebrate and share what goes on under the university’s STEM umbrella with future scientists, engineers and mathematicians,” said Susi Thelen, the UO’s outreach events coordinator. The Mini Maker Faire is September 15 and 16 at OMSI, 1945 SE Water Avenue, in Portland. Hours are 9:30 a.m.–5:30 p.m. Get tickets in advance. Use “Maker18” to receive $2 off.